You will probably first notice the effects of fleas when your dog repeatedly scratches and chews. On occasion you may actually see tiny brown fleas moving quickly through your dog’s haircoat. Your dog’s constant scratching may lead to visible patches of hair loss and reddened, irritated skin. Fleas may also cause skin allergies and can transmit other parasites, such as tapeworms, to your dog. Although your dog may be infested with fleas, they are not always easy to find. One of the best methods for checking your dog for fleas is to look for flea dirt (actually flea feces) in your dog’s haircoat. To check for flea dirt, briskly comb or rub a section of the hair on your dog’s back while your dog is sitting or lying on a white piece of paper. If your dog has fleas, black flecks that look like dirt (as a result, we use the term “flea dirt”) will fall onto the paper. If you transfer these black flecks to a damp piece of paper, in a short time they will appear red or rust-colored (see Figure 1). The red color results because blood sucked from your dog is passed in the flea’s waste matter. If the dirt specks do not turn red, then they are probably “regular” dirt. To control fleas, you must stop them from reproducing. Carpets, pet bedding, furniture, and other indoor areas where your dog spends much time will contain the highest number of developing fleas (see video above). Frequent vacuuming of these areas (throw the vacuum cleaner bag away afterwards) and frequent washing of your dog’s bedding can greatly reduce the number of developing fleas inside your home. Fleas also develop in shady, protected outdoor areas. These outdoor spots can easily be identified as the places where your dog likes to rest and relax. Remember, if your dog does not feel comfortable spending time in a particular area, then neither will fleas. Dogs and fleas typically like the same locations. Both indoor and outdoor areas can be sprayed with insecticides to eliminate fleas, if necessary. Treatment of your home or yard is best performed by a trained pest control expert. Consult with your veterinarian as to which flea products will break the flea life cycle in the environment. 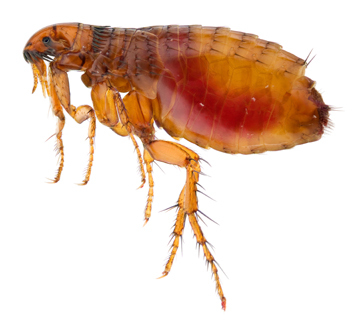 For veterinary professionals, more detailed information on fleas can be found at https://www.capcvet.org/guidelines/fleas/. You may see fleas in your home or on your dog, or simply see your dog scratching and chewing itself. You can test for fleas by looking for "flea dirt" as described above. Frequent vacuuming and/or washing of pet bedding, carpets and furniture can help control fleas. You can spray with insecticides indoors or outdoors to eliminate fleas, if necessary. Cats and dogs can share fleas. 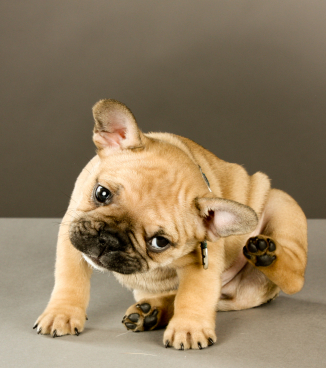 Flea treatments for your dog can protect, treat it and break the flea lifecycle. While fleas are primarily an annoyance, they can carry other illnesses. Dealing with fleas requires both controlling flea populations in your pet's environment and killing fleas on your pet. Your veterinarian has treatments that are not available over the counter.